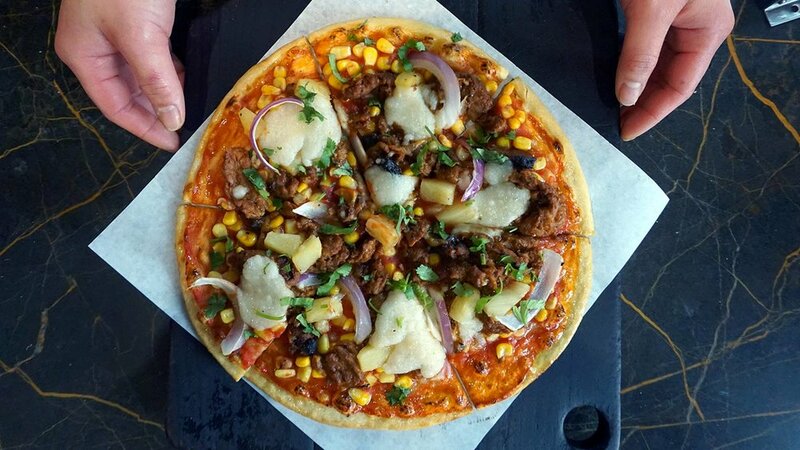 Virtuous Pie's Southern Belle is delicious, savoury and colourful. The Planter’s Guide is undertaking a personal challenge to try EVERY SINGLE PIZZA from Virtuous Pie, an assignment made even more delicious considering the award-winning restaurant chain has added unique items to its newest location at UBC in Vancouver. Why undertake such a task? Because life is short and ordering the same pizza every time is boring. Sure, re-ordering classic faves such as the Margherita (San Marzano tomato sauce with gooey cashew mozzarella, fresh basil leaves and EVOO) and Stranger Wings (with spicy cauliflower, crispy shallots, and a blue cheese drizzle) will always leave you satisfied, but variety as they say…. Take the Southern Belle, a Dixieland-inspired pie that’s currently on offer at all three locations. The barbeque-flavoured soy shreds are bold, savoury, and chewy. They offer a kiss of chipotle smoke flavour with each tasty bite, balanced by the pop of the corn kernels, the sweetness of the onion and pineapple. Finely-chopped cilantro adds colour and freshness. And that crispy, lightly charred crust. It’s perfect every time. Wine and beer is served on tap. Consider pairing your meal with a glass of Cabernets (a red blend of Cabernet Franc and Cabernet Sauvignon) from Summerhill Pyramid Winery in Kelowna, Canada’s most recognized organic winery. Rich and delicious, it’s this pie’s perfect partner. The 2017 VegNews ‘Restaurant of the Year’, Virtuous Pie is expanding! There are now two locations in Vancouver – Chinatown (583 Main Street) and UBC Wesbrook Village (3339 Shrum Lane), and one in Portland (1126 SE Division Street). A new location is opening soon in Toronto (611 College Street). Watch for a behind-the-scenes feature with the Virtuous Pie team, coming soon to The Planter’s Guide.